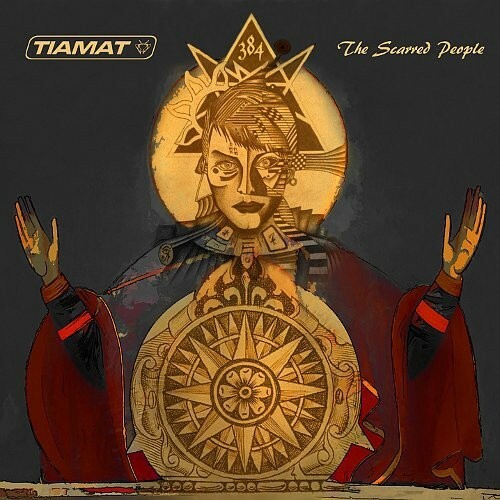 The Scarred People’ is the tenth full-length studio album from Tiamat, the Swedish band that’s evolved massively since it changed its name from Treblinka and put out its death metal debut ‘Sumerian Cry’ in 1990. The story goes that back in 1997 or so when ‘A Deeper Kind Of Slumber’ was released the band’s frontman Johan Edlund declared to the effect that all future albums would have a more gothic sound, and certainly that’s been achieved with grandiose depth and breadth on ‘The Scarred People’, the band’s first release since 2008’s ‘Amanethes’ and their debut for Napalm Records. But that’s not to dismiss the album with a single tag. OK, so across its eleven tracks ‘The Scarred People’ is largely a mid-tempo affair, hardly likely to break a sweat at any time, but it’s widely evocative both in terms of music and lyrics, and the seemingly plaintive guitar work (check out the break in ‘The Sun Also Rises’, for example, or ‘Radiant Star’, or the lengthy workout that permeates through ‘Love Terrorists’) adds layer upon layer to Edlund’s tortured vocals. And although the title track opens proceedings with a gothic grimace and a Sisters Of Mercy groove a lot of the material sounds not unlike some of David Bowie’s later output; and with a vocal delivery frighteningly like the Thin White Duke at times, in songs like ‘Messinian Letter’ and the aforementioned ‘Love Terrorists’ there are moments where Edlund could pass himself off as a Bowie soundalike. This is a glorious album, beautifully structured and delightfully executed throughout. ‘Messinian Letter’ is a bit too MTV and stands out as the only obvious commercial dissenter in an army of exciting goth-metal, but there’s no reason to let that hiccup spoilt the party as it gives way to another Sister-style stomp in ‘Thunder And Lightning’. Oh yes, and crank it up for the atmospheric closing cut ‘The Red Of The Morning Sun’ loud and let the goosebumps run over you. Anything from Tiamat (well, almost anything) is well worth checking out and as ever these days, ‘The Scarred People’ comes in a wide variety of versions so there’s something for everyone; choose from a box set, a digipack with four bonus tracks and the now almost obligatory limited edition (and rather pricey) expensive vinyl version.